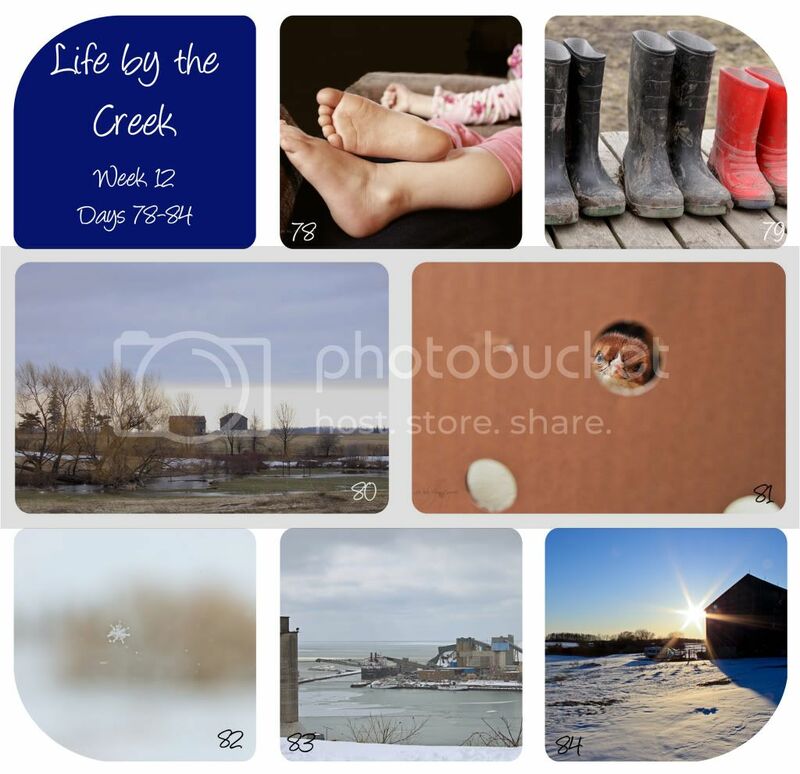 Time for my Project 365 round up! Day 79: Rubber boots. They WERE our footwear of choice. Now we’re back to snow boots. Day 81: Picked up 24 layer chicks! LOVE that this one poked up her head just in time. Day 82: Woke up to winter again. So much snow… Caught a snowflake on my kitchen window… and that’s the HUGE willow tree in the background. Day 83: Boat at the mine getting a load of salt. Jeff is still laid off… hopefully they’ll get called back this week. So there you go. That’s how it’s been around the creek this week. Check out other project’s at Sarah’s. Wow!! They are all gorgeous. I love the snow flake, sunburst and chick! We need to get more. ha ha! One of ours just escaped this morning. Hope it warms up for you. Have a great weekend. Oh how I love those little feet- so precious! Best week yet! They are all creative shots, I like them all. The boots are cool, the snowflake on the window is awesome. The starburst pic is perfect, too.